Our wide variety of Laptop Carts allows you to choose what�s important to you. All of our Laptop Carts protect and securely store your laptops. 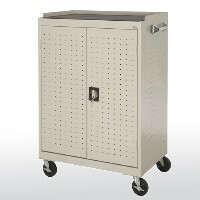 The Laptop Carts are easy to transport when you need a large amount of laptops for a presentation or lesson. Don�t fret over leaving your valuable electronics when you can lock them up in a Laptop Cart. Whether you use the laptops often or rarely, the Laptop Carts can be put away or made to be out in the open. Choose from a variety of colors, and metal or wood finishes, to customize the look of your work space. Feel confidant knowing that our Laptop Carts are made to specifically store, protect, and give mobility to laptops.